Posted on May 1, 2018 at 3:01 pm. 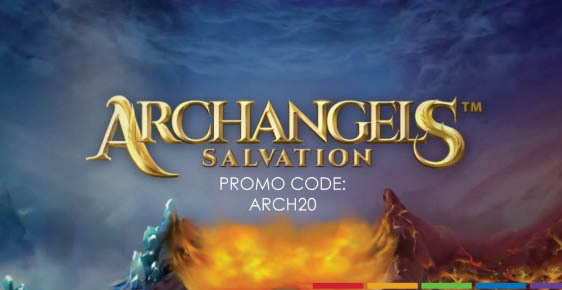 SlotsMillion.com has a great promotion running celebrating the release of new Net Ent slot game Archangels Salvation. The game is based around the fight between Good vs Evil and the promotion will net you 20 free spins on your second deposit, when you use the promo code ARCH20 and deposit a minimum of €20 . The promotion is available to players from Finland, Sweden, Norway, Germany, Iceland, Ireland, Luxembourg, Netherlands, New Zealand, South Africa, Switzerland, Austria and United Kingdom. The bonus has a 48x wagering requirement on any winnings and standard Slots Million terms and conditions apply. Slots Million recently amended its wagering requirements on bonuses right across the board, from a standard 35x to 48x. Slots Million has plenty of other promotions running weekly, including night’s celebrating both men and women. 18+. Gamble Responsibly. BeGambleAware.org. Read the full terms and conditions here. The team behind Slots Million (read a review), Alea Affiliates has been nominated for several awards at the EGR Marketing & Innovation 2018 Awards. Alea has short listed in both the Innovation in Casino and the Affiliate Marketing Campaign categories, which are two of the most coveted in the industry. Alea, formerly known as Affiliate Republik, has grown a strong reputation for player fairness and quick payouts. The EGR winners will be announced at the Hurlingham Club in London on June 20.